Something that I speak about often in my classes is this idea of trusting in your intuition/the universe. I think I talk about it so much because it’s something that I’m constantly trying to work on myself. My Capricorn tendencies guide me towards overanalyzing and trying to plan for everything. I saw this quote the other day from @spiritdaughter that said “Flowing will get you places that forcing never could,” that sparked my intention for this week. This is so relevant in our yoga practice and in life, your practice off the mat. In asana, the physical practice of yoga, if you try to muscle your way into a new pose or into a deeper expression, your body will actually tighten up, doing just the opposite. It’s only through relaxing and breathing that you are able to go deeper and find new limits, maybe moving into a pose you didn’t think was even possible for you. It’s a beautiful metaphor for life off your mat as well. If you are able to let go and ‘go with the flow’ so to speak, opportunities often present themselves that you otherwise may not have been open to. In order to let go you have to trust the universe which I know sounds a little corny and woowoo but if you can start to develop this level of trust and belief that things are going to work out just the way they should, little miracles will start to pop up all around you. Part of this is just recognizing and having gratitude for all of the small miracles that are already present in your life. Another element to this trust concept is Divine Timing. We live in an outcome driven society and it’s easy to get caught up in when things will happen or how they will unfold. I’ve been noticing this a lot especially with beginners in my yoga classes. They get frustrated after a couple of weeks of doing a certain pose or a certain transition without noticeable improvement. However there are subtle shifts happening all the time. Yoga takes time and repetition, that’s why it’s called a practice. It also takes that balance of effort and ease (sthira/sukha, yin/yang). So this relates back to the intention because of course you have to put effort in to achieve things but you also have to find that level of letting go and surrendering to what will be. When you take time to quiet your mind through meditation, yoga, walking, writing or whatever it is that makes you feel at peace, you are able to step out of the way so that your intuition can come through. Most of us move through life with our egos guiding the way, constantly chattering and telling us what we should do. Developing these practices to begin to recognize what that egoic mind sounds like and learning to shush it every now and then, gives us the clarity to tap in to what we know on a soul level. © 2019, domenicadreamsofcalamari. All rights reserved. 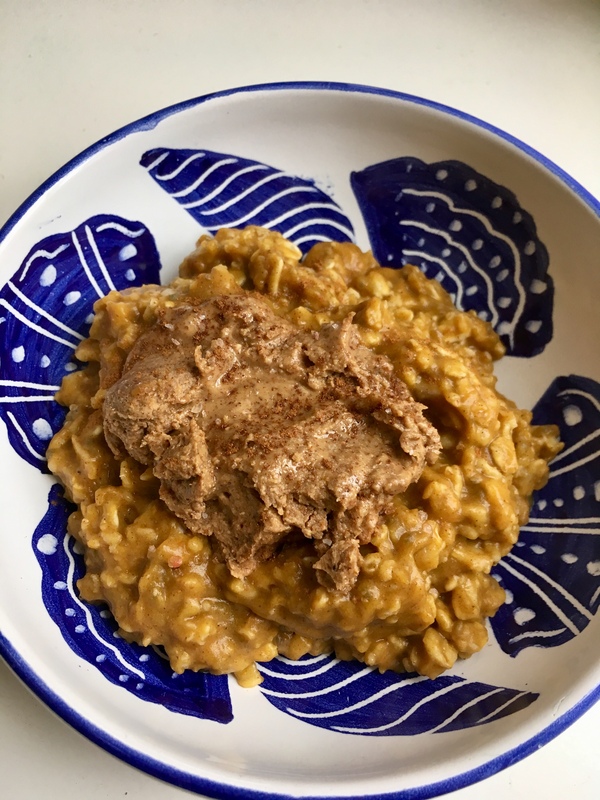 Going along with the pumpkin theme this week (and to use up the rest of the can of pureed pumpkin that I opened for the cookies) I made this delicious pumpkin oatmeal this morning. It’s so tasty and warming, definitely not any boring old oatmeal! top with a blob of almond butter and maybe a little more cinnamon and dig in! © 2018, domenicadreamsofcalamari. All rights reserved. Making Pumpkin Spice stuff always reminds me of college. 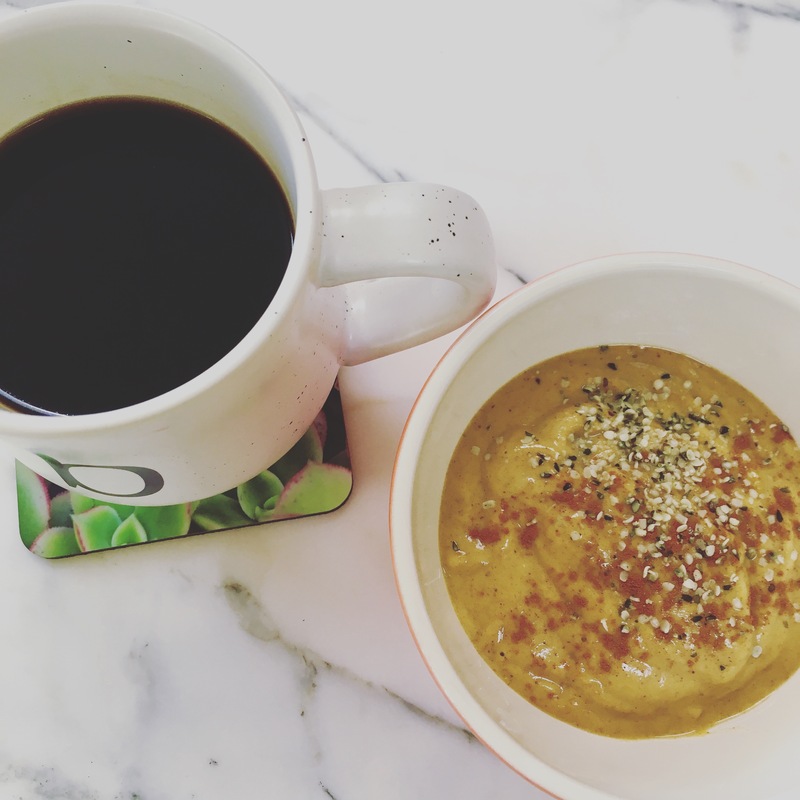 Not just because PSL are so often associated with college girls but because it was in my college years at Cal Poly that I started experimenting with pumpkin pie spice in recipes. There’s something about it that’s just soo comforting. It reminds me of Fall, the start of the new school year, and being so inspired in such a fun time of my life. What memories does it bring up for you? This smoothie is pretty healthy and not too sweet. 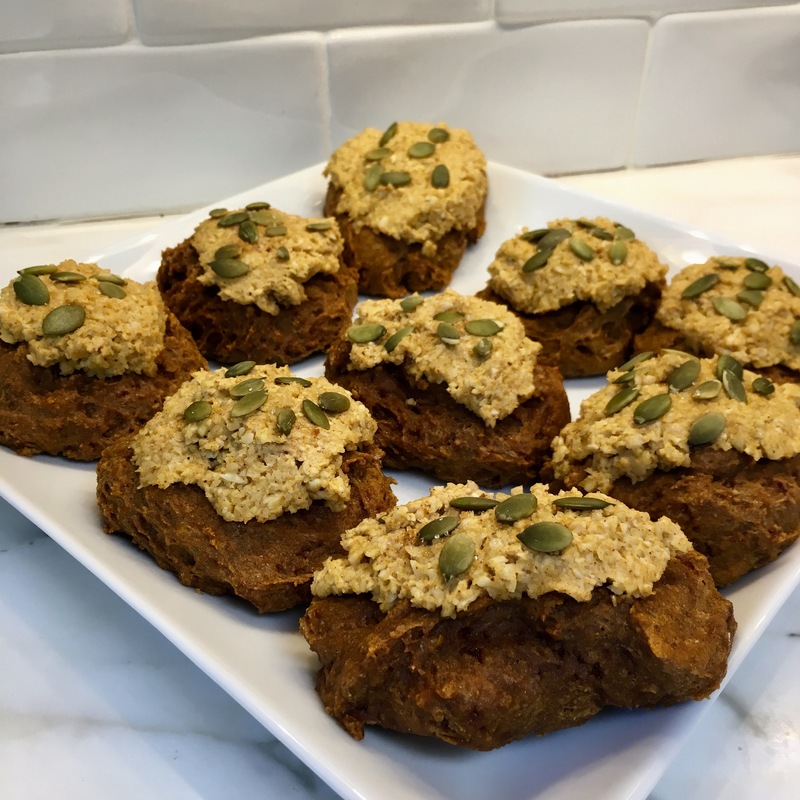 I made this original pumpkin cookie recipe in college and today is really feelin like Fall so of course, I wanted to make something pumpkin-y, cus ’tis the season. However I wanted to make these a little healthier so I made some substitutions et voila. I still used an egg but if you really want these to actually be vegan you can try a flax egg instead! This was my first real foray into making a nut-based cheese sauce but I thought I’d give it a shot. Nutritional yeast is kinda weird but REALLY works, it’s crazy. 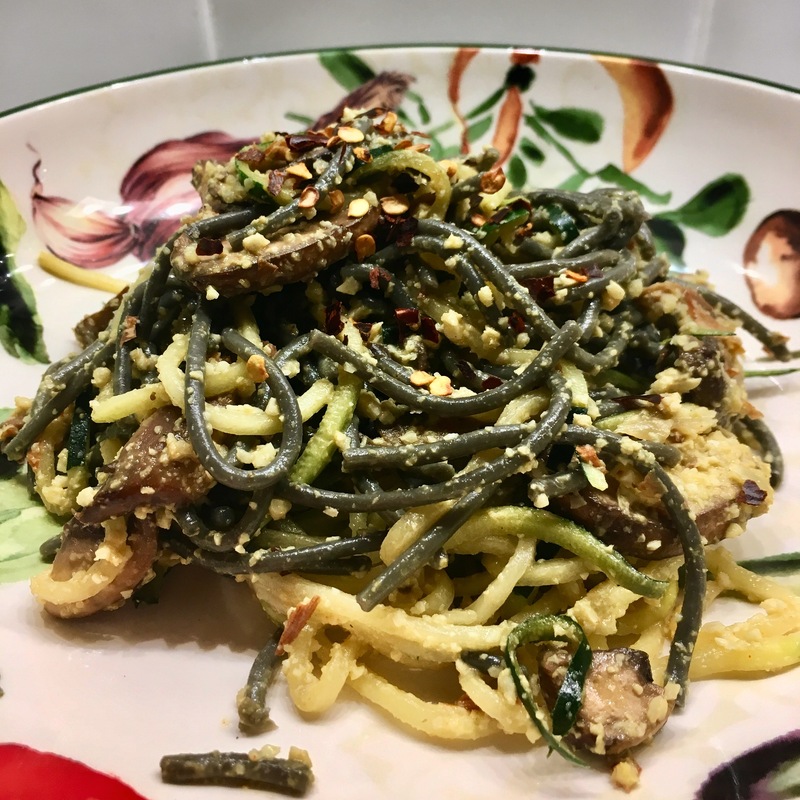 Also I wanted to use up the rest of my squid ink pasta and also use zucchini noodles so I just went ahead and combined them here. You can definitely use one or the other but you gotta admit, it does look pretty cool with two colors of noodles. garnish with basil or chili flakes or both, done! 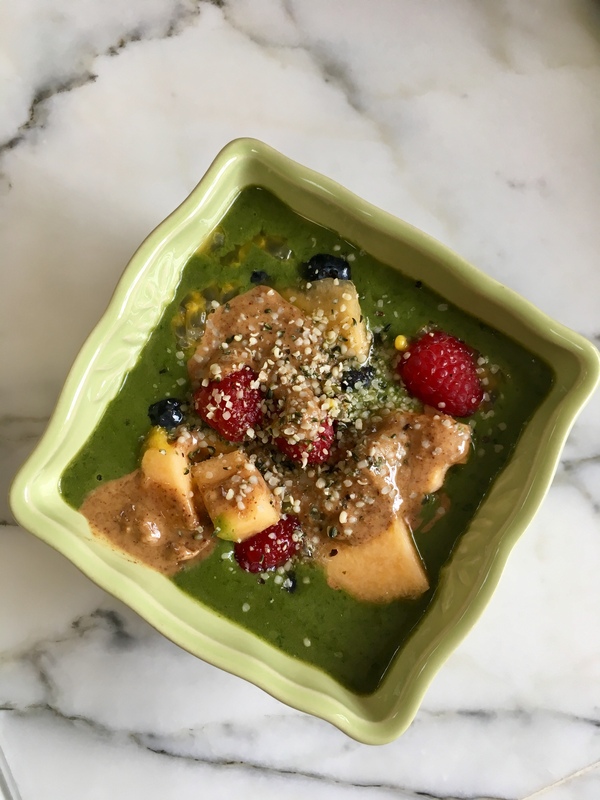 I love making smoothie bowls for breakfast because they’re so versatile and tasty! They also pack a ton of nutrients and don’t make me feel heavy or gross throughout the first half of my day. I always use Vega Vegan Protein Powder as a base. I’ve tried whey based ones and my stomach does not agree with them and they are usually way too sweet. Vega also has antioxidants and greens and no artificial additives or sweeteners, so basically it’s the best! I get the vanilla one at Costco and it’s super high quality and not too expensive. I usually use matcha and frozen bananas as well but from there the recipe varies day to day! It’s always nice to add a seed or nut on top to make them crunchy and the ginger is a nice touch. Last weekend I went camping in Joshua Tree. It was an amazing amazing experience but by the time I got home I was ready to leave my Lara Bar/Apple/Hummus meals behind me and make some nice pasta. 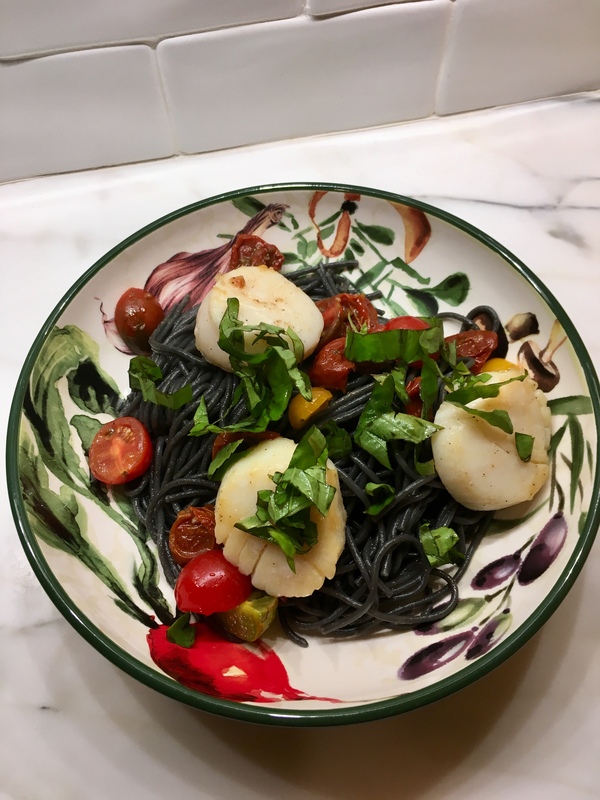 I picked up this squid ink pasta from Trader Joe’s a while back and hadn’t had the chance to try it yet. I’ve always like squid ink pasta, it’s super popular in Southern Italian cuisine, especially when it’s a seafood pasta. I worked at the Fish Shop during the day so I brought home these beautiful scallops :). Maybe I’m biased but I think they’re the bessssst. These roasted tomatoes are also a new Trader Joe’s item that are bomb.com. slice basil and use it to garnish, parmesan and red pepper flakes optional! 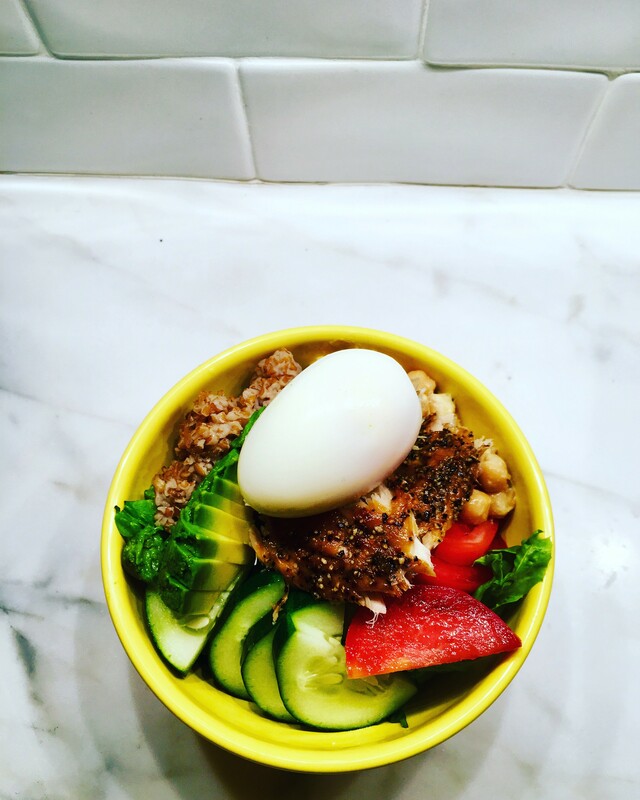 It’s been sooo hot (or at least soo hot for us coastal San Diegans) so I’ve been trying to come up with sneaky ways to avoid turning on the oven at all and still having protein/veggie rich meals. I love love love smoked fish but it can sometimes be pricy. This peppered rainbow trout from Trader Joe’s is the bomb and is also only $4 for a pack that has 4 servings. Thanks Trader Joe’s! Another shoutout to my dad’s friend, Tom, for supplying us with a steady source of avocados from his tree! peel eggs and place in each bowl and lastly don’t forget the fish! It’s been very hot and this just sounded like the perfect thing to eat yesterday. This salad is a great Summer salad because you can chill it and it’s very refreshing. Not to mention it’s a gorgeous! 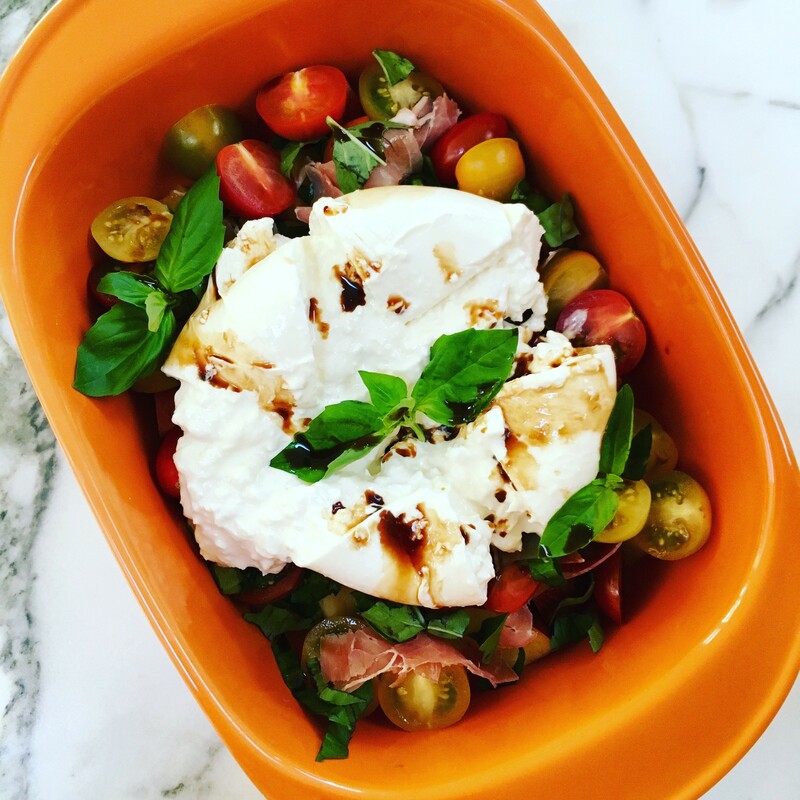 The nectarines make it sweet, the tomatoes make it tart, the prosciutto makes it nice and salty and the burrata makes it creamy and decadent! Can’t forget basil and balsamic for depth of flavor! We grew these nectarines and they are AMAZING, also my uncle grew the basil which is also amazing. I will never get sick of burrata. Or prosciutto. 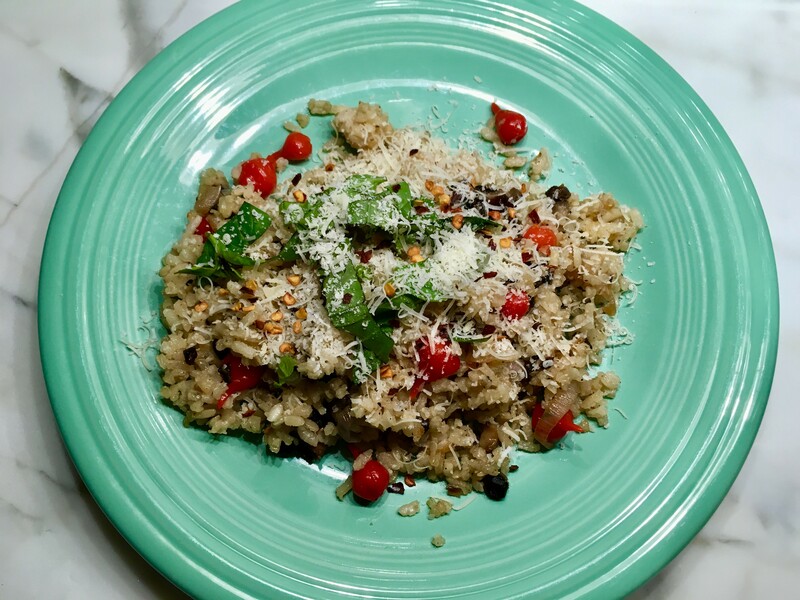 drizzle balsamic on top and garnish with basil leaves! I get very excited to got to Costco and see what’s new and this week they had… beautiful portobellos! I love love love mushrooms so it was an exciting find. We saw a recipe for a smoky mushroom risotto and loosely based this off of it, tweaking it with what we had. We added these mini peppers for a little flavor contrast and color.